Who came first to Botswana? The Bantu, the San or the Khoi...? All the three groups of the Bantu, San and Khoi originated in the north of Africa and migrated to the south with the Bantu being the first settlers in the Cape area in South Africa in 300A.D. be incorporated into South Africa. The San and Khoi were later to follow the Bantu and settled in the Cape area too. The San were the original inhabitants of Botswana after they were driven out of the Cape area. It should be remembered that they were at one point spread over most of Africa, as evidenced in the rock paintings found across the continent. Therefore some settled in Botswana, whereas others did so in other parts of Africa, when they found the area uninhabited. They were then followed by the Khoi and Bantu speakers into Botswana. San? Khoi? What's the difference? The world cannot make a difference between the San and the Khoi. However, the San(also called the Bushmen or Khoisan) were hunter-gatherers, while the Khoi(also known as the Khoikhoi or Hottentots) were herders. The San are predominantly found in Botswana today. They settled in the Cape of South Africa for some time, but were eventually pushed out into the Kalahari by the European settlers, Zulus and Xhosas. These groups felt that the San, who considered livestock to be easy prey, stole their cattle. Read more about the San and the Khoi who are collectively known as Basarwa or Bushmen. Some pockets of Tswana speakers decided to move northwards from the Cape in the 14th century. They came with agricultural, iron-working practices and a different dialect. The San and the Khoi immediately sensed the superiority of the new settlers because they (the Bushmen) still used simple stone age technology compared to those more advanced tools owned by the Tswana. This factor along with a series of other factors led to the Bushmen retreating into the Kalahari, a spot not considered the sweetest in the region. Exactly, what does 'Tswana' mean? The meaning or origin of the name 'Tswana' is not known. But it is understood that the word came from the Xhosa of South Africa. The Xhosa were wont to use it in reference to all of the interior Bantu speakers who were sub-divisions of the Sotho people. The word may mean 'same or similar' or even 'together' as in the Setswana word 'tshwana'; referring to many of Batswana groups who were considered to have similar origins. Tswana and Sotho.... blood relatives! It is commonly believed that the Sotho are the ancestors of the Tswana. Further, both groups are believed to be related as they share the same ancestor, Mogale. A great Sotho chief called Masilo had three sons who are alleged to have established the Kwena, Ngwato and Ngwaketse tribes all of which are Botswana tribes. Conversely, it is also alleged that Kwena was the father of Ngwato and Ngwaketse. The Tloka Sotho of MaNthatisi led by her son Sekonyela, led to the establishment of the Tlokwa people who are also a Botswana tribe. But the superiority of the Tswana was well established in the Limpopo and Mpumalanga in South Africa between the 13th and 15th centuries. Wars broke out in the region around the 17th century over trading, land and power which culminated in what is known as the Defequane or the 'break up' of the Tswana people. These wars were the major turning point in the region and in the history of the Tswana. Large groups of Tswana speakers broke away from the main Tswana kingdoms - being the Hurutshe and Kwena, and moved into Botswana. More groups, even from the Nguni people - that included the Shona, Ndebele, Zulu - moved into the area and settled in the northern parts. Among these were the Kalangas who either incorporated or greatly inter-mixed with the Kwena from Tswapong, Babirwa of Serumola and Merola from Limpopo, Bahurutshe and Bapedi from South Africa. These broke away from the Nguni in South Africa either before or right at the time the Defequane war broke out, and moved in a south-north direction. Between the late 18th and early 19th centuries Tswana groups evolved and different tribes were established. Amongst these was the Bagamangwato tribe which was led by Khama the Great who first converted to Christianity. 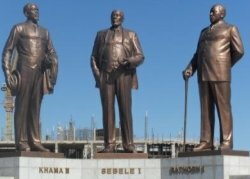 Born in 1837 at Mosu, a place of historical significance near Makgadikgadi Salt Pans, where there are Khama ruins now, Khama the Great (sometimes called Khama the Good) built a united Botswana nation by bringing together many other Tswana tribes. Khama the Great was later to seek protection together with other Tswana chiefs Bathoen and Sebele from the British in 1885 as the Tswana were attacked by the Boers and Ndebele. And Britain obliged. He later died in 1923. When the British offered the Tswana protection on the 31st March 1885 the area was named Bechuanaland. However, the northern part of Botswana was put under direct administration of the British while the southern part of Botswana became a part of the Cape Colony, a part of the North West province of South Africa. Botswana's incorporation into South Africa....failed!!! It was intended that the southern part of Botswana will later be incorporated into the union of South Africa as a plan to bring together the main British colonies in the region. But this incorporation never really took place as a series of events led the British to change their minds. Cecil John Rhodes of the British South Africa Company was to be the beneficiary of this incorporation. But the three Tswana Chiefs did not trust Rhodes and sought protection from the British. An agreement was made, with the Tswana conceding some land for Rhodes' railway. However, Rhodes attacked settlers of the Transvaal area in what is referred to as the Jameson Raid, which angered the British who decided to change their minds on the incorporation plan. Further, after South Africa formed a union state in 1910, conducted elections in 1948, subsequently instituted apartheid and withdrew from the Commonwealth in 1961 the British made up their minds that Botswana will not be incorporated into South Africa. Instead the British themselves continued to govern the Protectorate for the next 70 years. But change of heart by Britain - from incorporating Botswana into South Africa - was not the only influence that stopped the incorporation. The major influence came from the complete refusal by Batswana represented by their chiefs to be part of South Africa. Batswana have for a long time not forgotten the effects of Defecane war on 'nation' building and were decided in being independent when they broke away from the Hurutshe and Sotho tribes in South Africa. Similarly, Batswana of Botswana were aware that many Batswana and other Africans resident in South Africa were having a hard time under the apartheid regime in that country. In 1964 Botswana made further proposals to be an independent state. Once again, Britain obliged, and Botswana got on its way to form a democratic self-government. The country's name changed from Bechuanaland to Botswana. Since the seat of government for Bechuanaland was in Mafikeng South Africa, it had to be moved to a place in Bechuanaland, and Gaborone was eventually chosen as the more suitable to be the capital. So, in 1965 the seat was moved to the newly established Gaborone capital. The Botswana constitution, drawn in 1965, led to the first general elections and subsequently to independence on the 30th September 1966. Political parties were formed, and Seretse Khama of the Botswana Democratic Party (BDP) and descendant of Khama the Great lineage became the country's first president in the first political elections conducted in 1965. Ever since, Botswana has conducted regular elections with the BDP winning the seat on all occasions. Seretse Khama was re-elected twice and stayed president until he died in 1980. Quett Masire took over the presidency at the death of Khama and got re-elected three times in 1984, 1989 and 1994. In 1998 Masire retired from office and Festus Mogae took over and got re-elected twice in 1999 and 2004. Mogae also retired in April 2008 and handed over the presidency to Ian Khama, son of the first president. Ian Khama was elected in 2009 and is now the current president of Botswana.